For your next event, consider a poker tournament by Fantasy Casino. Our tournament directors and dealers are professionally trained to run poker tournaments. As your guests arrive, they will be given a seating card. This will tell them their starting table and seat number. Upon arriving at the table, the dealer will direct them to their seat, collect the seat card and give the player their starting chips. For the less experienced players, we offer the option of a free tutorial prior to the beginning of the tournament. One of our professional dealers will explain the rules and procedures of a poker tournament to any of your guests who would like to learn a little more prior to the tournament. Once all of the players are seated, the tournament director will announce the rules and blinds to the players. Any late players will still be allowed to play. A position will be held for them and any blind bets will be removed from their chip stack. Play begins with each player receiving an equal amount of chips. As play progresses, the amount of the blind bets increase. A customized blind structure will be determined prior to your event based upon the starting chip count, number of players, and length of the event. Most events are scheduled for four hours but larger events can take longer. As play continues, players will be eliminated from the tournament. The tournament director will continually move players around and break down tables to keep the same number of players at each table. Play will continue until one person accumulates all of the chips and is declared the winner. Re-buys and add-ons are the best way to increase your profits if you are having a poker tournament fundraiser. Your event manager at Fantasy Casino can explain the benefits of re-buys and add-ons. Tables - We use high-quality Texas Hold'em tables. Our tables seat nine to ten players plus the dealer. Fantasy Casino only provides tables. The client will need to supply 10 chairs per table. Tournament Director - The tournament director will be the main person in charge of your event. He is in charge of moving players and breaking down tables. Our tournament directors employ the rules developed by the Tourna﻿ment Directors Association and used in many big buy-in professional events so that your event is run to the same standards as a televised poker tournament. Dealers - Our dealers are professionally attired in tuxedo shirts and bow ties. Our tournament dealers receive additional training to ensure your event runs smoothly and all of your guests have a great time. They also will assist novice players by clearly explaining rules and procedures. Seat Cards - We provide seating cards for your guests so that seating is random. Accessories - All of the chips, cards and other accessories needed to run a tournament. We use 100% plastic playing cards and 11.5 gram, composite, tournament chips just like those used in many casino poker rooms. Our chips have the denomination printed on them to eliminate any confusion by your guests. If you are having a poker tournament as a fundraiser, you must register with the State of California. Fantasy Casino is licensed with the California Department of Justice to conduct charity poker tournaments. Use the link below to register with the DOJ. Your Fantasy Casino event manager can help you through the process of registering also. 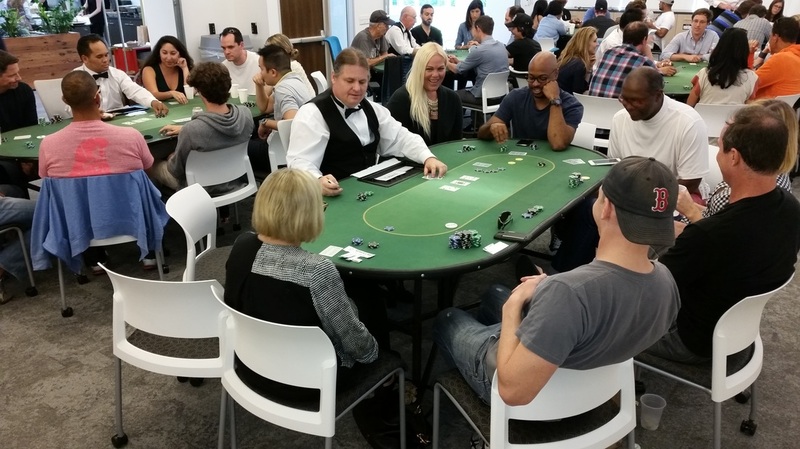 Let Fantasy Casino make your next event a huge success with a Texas Hold'em poker tournament. Request a quote today and our tournament specialist will put together a customized quote for your event.